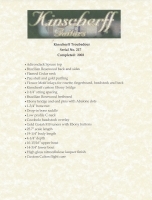 Offered here is something really special, a Troubadour Custom built by Jamie Kinscherff back in 2002. For those who haven't heard of Jamie, he is a Texas native who started building guitars in the late 70's. Before starting his own company in 1990, Jamie spent several years working for Taylor, and some artistic characteristics of R. Taylor guitars can be found in Jamie's work. His guitars are a thing of sonic and physical beauty. 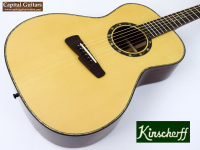 This particular Kinscherff Troubadour is a one-of-a-kind instrument. The Troubadour is a small guitar the size of a Gibson L-00 with a body length of 19-1/4", a maximum body depth of 4-1/4", an upper bout that is 10-15/16" wide and a lower bout that is 14-3/4" wide. 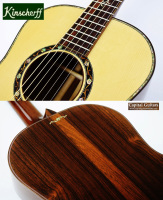 While generally built as a 14-fret, short scale instrument, this particular Troubadour was ordered with a 25.7" string scale. The top is lightly figured Adirondack Spruce. 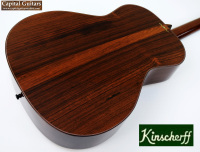 The back, sides, fretboard are made of the same batch of very old Brazilian Rosewood. The headstock overlays (top and back) are made from Cocobolo. 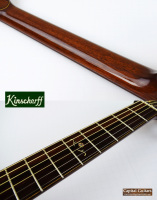 The neck is flamed Cedar, with a low profile shape and depth measurements of .83" at the first fret and .92" at the ninth fret. The bone nut is 1-3/4" wide. 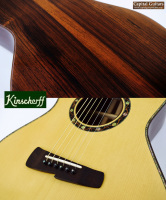 The bridge is a Kinscherff custom design and is made of Ebony with string spacing of 2-1/4". The quality of the tonewoods used are incredible, but so are the cosmetic flourishes that Jamie has lavished on this instrument. The rosette is Jamie's Flower Motif pattern and is made of Ebony, Pau shell and gold. Flower Motif inlays grace the fretboard, headstock and back of the guitar as well. Pau shell and gold purflings grace the top border. Ebony bridge and end pins with Abalone dots provide elegant finishing touches. I loved this guitar immediately. It plays with great ease whether you use your fingers or a flat pick and the size is perfect for comfortable couch play. It has a classic voice that would be perfect for blues or jazz, with strong mids and a crisp top end. My playing does not do this guitar justice, but listen to the provided sound sample - this guitar sounds fabulous! It is currently setup with ninth fret string heights of 5/64" on both sides and there is lots of saddle remaining. Built in 2002, this guitar has clearly spent most of it's life in it's original case, which happens to be a $1K Calton, custom built for this guitar. The frets show little if any wear and the only flaw of any significance on this guitar is a .25" indentation at the lower part of the back of the guitar. It's very hard to see, but I've included a close-up photo. Other than this flaw, the guitar shows only the lightest of play and handling wear. Replacing this guitar today would likely be impossible because all of this Brazilian is gone I'm told, but if you could order one like it, you would spend well over $10K. Get this well-preserved, one-of-a-kind beauty for less than half that price. If you have been waiting for the perfect couch-buddy to come along, this little beauty deserves your serious consideration. 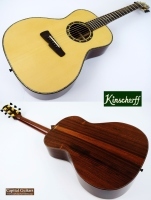 An absolutely superb acoustic!